The “Grandma” is dead…long live the “Gigi”. Growing up I called my grandmother Nanny. She made chicken soup and apple pies and wore an apron most of the day. My friends called their grandmothers by similar names, Nana; Grammy; Granny and they too cooked and baked and gave big hugs and wet kisses. Their hair was gray and their skin was wrinkled. They looked like the Grandmothers depicted in Norman Rockwell paintings. But that was yesterday. Today’s grandmother is a vibrant, active and improved version of her younger self. I am a grandmother of three ranging in age from 15 to 7. However, they do not call me Grandma or any of the names I mentioned previously, they call me Gigi. I chose this name the day my oldest daughter and her husband told me they were expecting. Upon hearing the news, I gasped — not out of excitement but out of shock. I was not the “grandmother” type. I didn’t bake, have gray hair (thanks to my colorist), nor did I have wrinkles (shout out to Botox). I still wore mini-skirts, played tennis, ran my own business and sang along (badly) anytime a Bon Jovi song was played. And because of all these things I needed a name my future grandchild would call me that was young and cool — like me. I sat that afternoon with my daughter and son-in-law in a local restaurant enjoying a cold beer (or two) with chips and salsa contemplating this news. My thoughts focused on what I would be known as going forward — Grandma (never! ), Nana (too old country) and then it came to me… Gigi. The name began with the same letter as grandma but with a completely different context. I thought it was original and more importantly it was hip. A few weeks after learning I would be a Gigi, I was with some friends and I was telling them the news when one of my friends said her grandchildren called her Gigi. Another friend said that was also what a friend of hers has her grandchildren call her. I soon found out that two other women who were my age and were mothers to childhood friends of my pregnant daughter and who lived in different parts of the country also were known by Gigi to their grandchildren. My original and inventive name (so I thought) was being used by so many of the women I knew who were or soon to be grandmothers. I realized that all these women, like myself, were caught in the same time warp — somewhere between being teenagers ourselves and grandmothers. Each of us wanted to retain our youth, and the idea of being a grandmother, or at least called one was not part of our DNA. The phrase “you are as young as you feel” needs to be changed to “you are as young as you call yourself” and calling ourselves grandma made all of us feel too old. 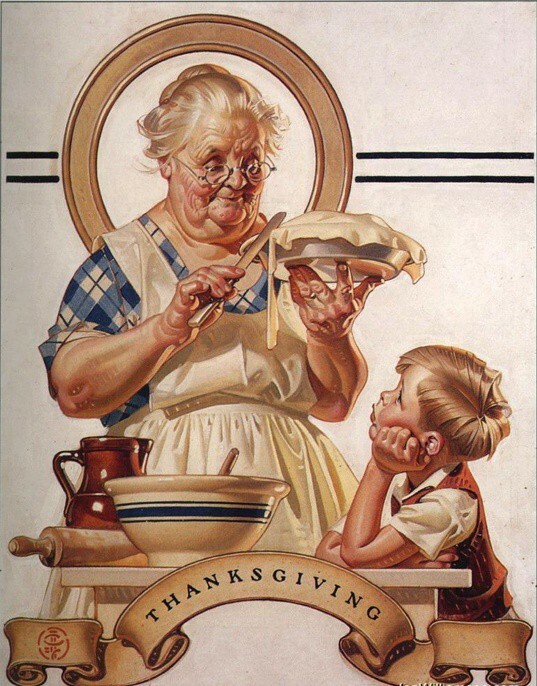 Over the years since becoming a Gigi, I have heard many a child call out “Gigi” at a pool, or on the beach or in the mall and each of these women are the antithesis of Norman Rockwell’s grandmothers or of our own grandmothers. We are the women of a generation that is fighting age, or at least the look of our age. Botox, Radiesse, Juvederm and jars of collagen infused moisturizers are our liniments. We are not the grandmothers of yesterday, we represent the women of today; CEO’s, Entrepreneurs, Astronauts, Scientists — who happen to have grandchildren whom we also give big hugs and wet kisses. But if my grandchildren are looking for an apple pie — they will find it in the freezer with the name Mrs. Smith on it.